Last time, I ended with the Jr. High School Years. At the end, I mentioned how we moved the summer before high school started. I was less than thrilled. Yet, as I look back, I can see God's hand on my life. Even if I wasn’t serving God, or going to church at the time, He knew what was going on. He was allowing all of this in my life and I’ve always believed that He was and is in control. Welcome to this week's link party! I can’t believe that I’ve been working on this staircase for 5 weeks! What? That can’t be right? But it is…and I thought this was going to be a quick project. My time projections seem to be way off! But what counts right now, is that they are DONE! FINISHED! VOILE’! 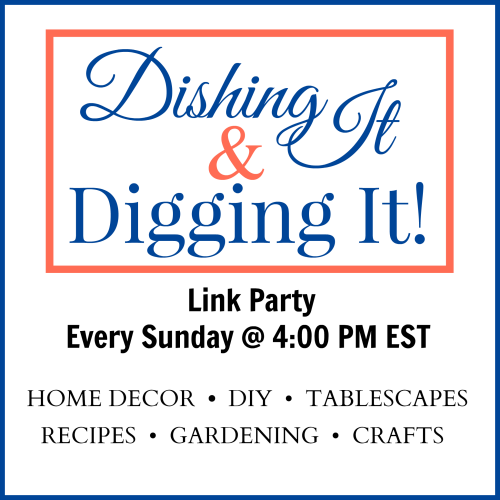 Welcome to another edition of Dishing It & Digging It! Link Party! Hi everybody! I am making some awesome progress on the staircase. I just finished taping off the last of the spindles and risers. It would be nice to start the actual painting this week… fingers crossed! In the mean time, I am sharing my life story. Last week, I started off with A Child of the 60s & 70s. Today, I’m going to pick up where I left off. I’m in the middle of 3rd grade and mom decided we were going to take a vacation.